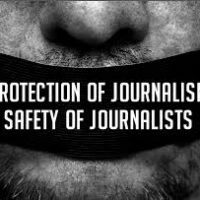 Editors (CPNE), Pakistan Federal Union of Journalists (PFUJ) and inclusive of the recommendations of the committee members and the UN guidelines, would soon be presented before the cabinet legislative committee for its approval. The Minister said the proposed Bill envisaged the establishment of a welfare fund for the journalists to which both the government and the media owners would contribute. Marriyum further said this fund would be constituted immediately after formal approval of the Bill. She said security, protection and welfare of the journalists were major concerns of the government which would be addressed through this legislation. The Minister told the committee that some people were not happy over the proposed draft Bill as they also wanted inclusion of job security in it. She added that the government could not be a party to the matters between the employer and employees as they were already covered by labour laws. She said when she took charge as Minister of State, former Prime Minister Nawaz Sharif had directed her to ensure early finalization of the law. Members of the standing committee appreciated the efforts put in by the Minister of State for framing of the proposed bill for journalists. In regards to responsibilities of PEMRA for regulating the electronic media, the minister told the committee that under the PEMRA laws, it was obligatory on private channels to have an editorial committee within the organization which were imperative to ensure self-regulation; as was the case in most of the democratic countries. She said Pakistan Electronic Media Regulatory Authority was performing its duties well but self regulation was the best way of bringing improvement. Marriyum Aurangzeb said the government had taken serious notice of a programme aired by PTV in which a poet ridiculed and stigmatized the Pashtun community and had imposed a life-time ban on the participation of the concerned poet in any programme of the official channel. She informed the committee that the producer, script writer and the members of the editorial committee who were supposed to preview the programme before telecast had also been suspended. The minister said it was a lapse for which she tendered apology in the National Assembly and the apology was also highlighted on social media network under the ministry and Secretary Information himself responded to comments of the people on twitter. She said a permanent editorial committee was being constituted in PTV to avoid such incidents in the future. The Minister further said the post of MD PTV was vacant currently but next week additional charge would be given to someone and report of the incident would be presented to the committee. The MoS revealed that the process for the appointment of MD PTV had already been initiated by advertising the post in the media. Marriyum said PTV had been working for national integrity and promoting regional languages and culture despite financial constraints. She also informed the committee that Intelligence Bureau had filed FIR against the fake list of members of parliament having links with banned organizations. The Minister revealed that there was a proposal to bring attached departments of the ministry in the rented buildings including Press Information Department, Directorate of Electronic Media & Publications, External Publicity Wing and Institute of Regional Studies under one roof. For this purpose, the plots owned by the ministry would be sold and a suitable building would be purchased to accommodate these departments, she added. Marriyum Aurangzeb explained to the committee that it was compulsory to get a certificate for advertisements from relevant departments but unfortunately the law was not being implemented properly.